Choc top ... designer Anita Jakobson wears a creation by Eva Rachline and Chocolat Chapon at the 14th Paris Chocolate Show . Soft-centred ... actress Sarah Marshall wears a creation by Jean-Claude Jitrois and Jean-Paul Hevin at the Fair. Sugar high ... artist Ericka Bailey wears a creation by Esmod, Nicolas Boussin and PCB Creation at the 14th Paris Chocolate Show. 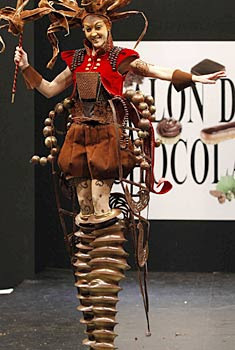 Choc coated ... French athlete Christine Arron displays a creation made from chocolate at the 14th Paris Chocolate Fair. 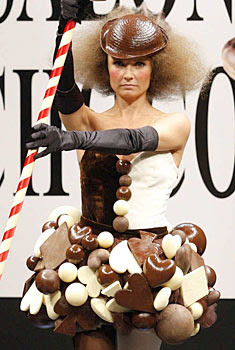 Chocolate balls ... Miss France 2008, Valerie Begue, wears a creation made from chocolate designed by Ana Quasoar at the 14th Paris Chocolate Fair. 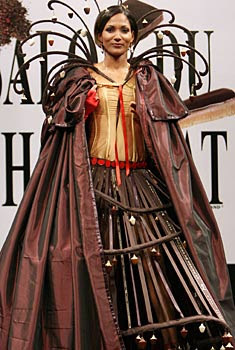 Hand it over ... French singer Laam wears a creation made from chocolate at the 14th Paris Chocolate Fair . 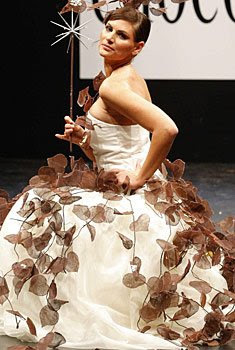 Chocolate leaf ... former Miss France 2004 Laetitia Bleger wears a creation by Aurelie Cherrel and Arnaud Larher at the 14th Paris Chocolate Show. Hoopla ... French actress Lilou Fogli wears a creation by Delphine Manivet and Chocolats Pralus at the 14th Paris Chocolate Show. Pole position ... French humorist Axelle Laffont wears a creation by Lovisa Burfitt and Cacao Barry at the 14th Paris Chocolate show.